What is the purpose of the holes marked “Do Not Cover” on hard drives? 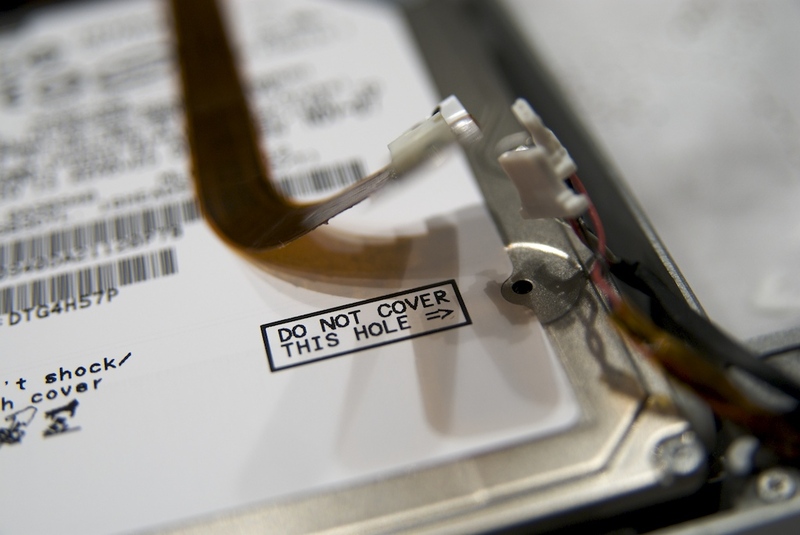 On many hard drives, there's a text warning to "not cover this hole", sometimes adding that doing so will void the warranty. What is the purpose of this hole and why would covering it cause damage or increase the likelihood of drive failure? It allows for equalization of air pressure between the inside and outside of the drive. While it is not a complete pass-through of outside air into the HDD internals, there is a diaphragm filter inside the hole that allows the air pressure to equalize. If the drive were completely sealed, operating at altitudes significantly different from those the drive was manufactured and sealed at would cause problems and increase the likelihood of catastrophic failures. This system works in much the same way as the eustachian tubes that allow our ears internal pressures to equalize, preventing the explosion or implosion of our ear drums. UPDATE: Per Moab's correction, it's a filter, not a diaphragm. The way it works and the reason it is included remains the same. Hard disk drives require a certain range of air pressures in order to operate properly. The connection to the external environment and pressure occurs through a small hole in the enclosure (about 0.5 mm in breadth), usually with a filter on the inside (the breather filter). If the air pressure is too low, then there is not enough lift for the flying head, so the head gets too close to the disk, and there is a risk of head crashes and data loss. Specially manufactured sealed and pressurized disks are needed for reliable high-altitude operation, above about 3,000 m (9,800 ft). Modern disks include temperature sensors and adjust their operation to the operating environment. Breather holes can be seen on all disk drives—they usually have a sticker next to them, warning the user not to cover the holes. It allows for equalization of air pressure between the inside and outside of the drive. In other words, it keeps the air pressure at the same pressure as atmospheric pressure. A hard drive is only designed for a certain range of operating pressures. The read/write head floats above the platter on a cushion of air. If the air pressure is too low, then there is not enough lift for the flying head so the head gets too close to the disk and there is a risk of head crashes and data loss. If the air pressure should be kept constant, why make a hole that allows the air pressure to change? The hard drive can be used in a range of environments with different temperatures, including ambient temperature and operating temperature. If the drive was completely sealed, the temperature differences would cause large pressure variations in the hard drive. The variation in atmospheric pressure is relatively small compared to these differences. Also, if the hole was blocked, the pressures could cause the case to bend and the spindle and arm to go out of alignment (theoretically; hard drives look quite solid). There is another consideration: The hard drive may not be completely air tight apart from the hole, although I'm not sure whether actual hard drives are built this way. In this situation, the hole acts as an easier pathway for air to flow so that the air flows through the filter rather than through unfiltered cracks that allow dust to enter the hard drive. The above being said, sealed hard drives exist, which have mechanisms to deal with the pressure changes. Note about the discussion in the other answer: If the drive were completely sealed, operating at altitudes significantly different from those the drive was manufactured and sealed at would have no effect at all (at the same temperature) because the hard drive is a fixed volume so the internal air pressure is unchanged. The breather hole allows condensation inside the hard drive to escape and it also equalizes the hard drive's internal pressure with the ambient pressure. The hard drive needs it to function properly, so make sure you won't occlude the hole. The HDD's spindle system relies on air density inside the disk enclosure to support the heads at their proper flying height while the disk rotates. HDDs require a certain range of air densities in order to operate properly. The connection to the external environment and density occurs through a small hole in the enclosure (about 0.5 mm in breadth), usually with a filter on the inside (the breather filter). If the air density is too low, then there is not enough lift for the flying head, so the head gets too close to the disk, and there is a risk of head crashes and data loss. Modern disks include temperature sensors and adjust their operation to the operating environment. Breather holes can be seen on all disk drives—they usually have a sticker next to them, warning the user not to cover the holes. The air inside the operating drive is constantly moving too, being swept in motion by friction with the spinning platters. Can storing my HDDs airtight damage them in anyway? Are hard drive disks airtight? Is it ok to band HDD in a completely non-ventilated cellophane? How to recover data from dead disk? What happened to my Hard Drive? If the hard drive is bad…? How should I solve this hard-drive lag issue? Does low free-disk space on HDD cripple computer performance? Is it 'bad' to read of a drive while writing onto it? Can you read and write 'simultaneously'? Is debugging bad hard-drives possible by intercepting SATA packages?